Army of One is a 2016 American comedy film directed by Larry Charles and written by Rajiv Joseph and Scott Rothman. The film stars Nicolas Cage, Wendi McLendon-Covey, Rainn Wilson, Russell Brand, Denis O'Hare, Paul Scheer, and Will Sasso. The film was released through video on demand and select theaters on November 4, 2016, before being released on DVD and Blu-ray on November 15, 2016, by TWC-Dimension and Anchor Bay Entertainment. The film follows Gary Faulkner, an ex-construction contractor and unemployed handy man who believes God has sent him to capture Osama bin Laden in Pakistan. The story is based on the real-life Faulkner who traveled to Pakistan looking for bin Laden. On January 21, 2015, it was announced Larry Charles would direct the film, with Nicolas Cage starring as Gary Faulkner, a handyman from Colorado who receives a vision telling him to go to Pakistan to capture Osama Bin Laden. On February 19, 2015, Wendi McLendon-Covey joined the cast. On April 16, 2015, Russell Brand, Denis O’Hare, Ken Marino, Paul Scheer and Rainn Wilson joined the cast of the film. Principal photography began on March 30, 2015, and ended on May 22, 2015. The film was released on November 4, 2016, through video on demand and select theaters before being released through DVD and Blu-ray on November 15, 2016. The film received negative reviews. It currently holds a 27% rating on Rotten Tomatoes based on 11 reviews, with an average rating of 4.2/10. ^ Peter Debruge (2016-11-05). 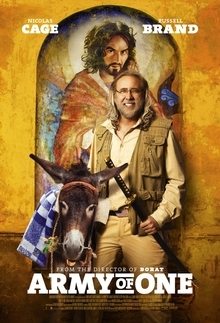 "'Army of One' Review: Another Unhinged Performance From Nicolas Cage". Variety. Retrieved 2016-11-07. ^ Master, Web (September 29, 2016). "Army of One Blu-ray". Blu-Ray.com. Retrieved October 1, 2016. ^ a b McClintock, Pamela (2015-01-21). "Nicolas Cage to Star in Osama Bin Laden Satire From 'Borat' Director (Exclusive)". Hollywood Reporter. Retrieved 2015-05-13. ^ a b Kit, Borys (2015-02-19). "'Goldbergs' Star Wendi McLendon-Covey Joins Nicolas Cage in Bin Laden Comedy (Exclusive)". Hollywood Reporter. Retrieved 2015-05-13. ^ a b c d e Busch, Anita (2015-04-16). "Russell Brand, Others Join Nicolas Cage In Comedy Army Of One". Deadline. Retrieved 2015-05-13. ^ "On the Set for 3/30/15: Brad Pitt, Christian Bale & Ryan Gosling Start on 'The Big Short', Julianne Moore Wraps 'Maggie's Plan' & More". Ssninsider.com. Retrieved 2015-05-21. ^ "On the Set for 5/25/15: Chris Pratt Starts on The Magnificent Seven, Brad Pitt and Christian Bale Wrap 'The Big Short'". Ssninsider.com. Retrieved 2015-06-17. ^ News Desk, TV (September 29, 2016). "ARMY OF ONE Coming to Digital HD, Blu-ray/DVD & On Demand". Broadway World. Retrieved October 1, 2016. ^ "Army of One (2016)". Rotten Tomatoes. Retrieved December 28, 2017. This page was last edited on 28 March 2019, at 12:10 (UTC).